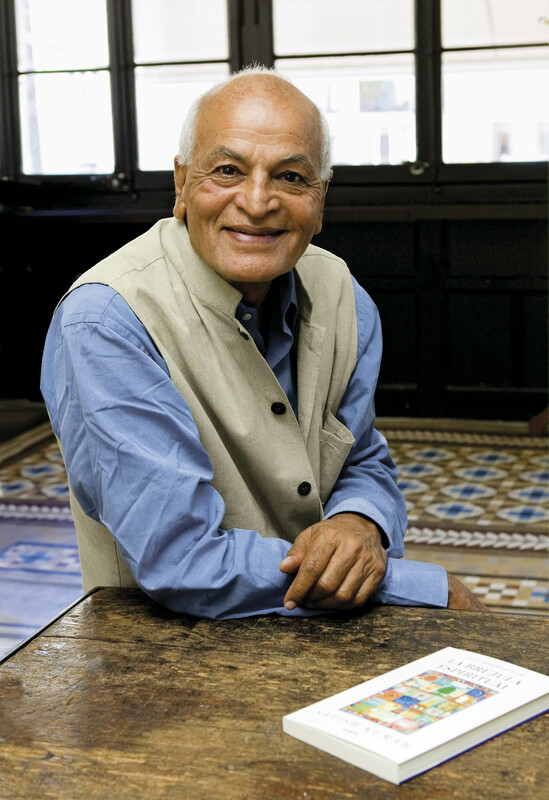 Satish Kumar is a former monk and long-term peace and environmental activist. Inspired in his early 20s by the example of the British peace activist Bertrand Russell, Satish embarked on an 8,000 mile peace pilgrimage. In 1973, he settled in the UK, taking the position of Editor ofResurgence and Ecologist Magazine, a position he continues to hold. If you would like to find out more about Satish, you can read his autobiography ‘No Destination’, alongside his other books including ‘You Are, Therefore I Am: A Declaration of Dependence’. Sacred Music Radio was fortunate to sit down with him and discuss the current shape of interfaith relations, and the role music has in it. In your 60s you undertook a truly amazing pilgrimage with your friend, which saw you cover the 8,000 mile journey from India to America- How did this incredible journey change you? Going around the world without any money gave me a sense of profound trust in people and in the universe. The idea that someone could go through Muslim countries, Christian countries, capitalist countries, the wilderness, and the desert and can survive gave me a profound trust and faith in people. How do we feel we can best achieve interfaith harmony? We have to see people as people, and then whatever occasion you are organising, always consider bringing people of different faiths. Different faiths should be celebrated, not viewed as a division or source of conflict. It is wonderful to have Hindus, Muslims, Christians, Jews and many other faiths, as it creates a diversity of philosophy, religion and faith. It would be boring if 7 billion people on this earth were all following the same religion or faith. If you have a garden, you wouldn’t want one with only roses, you would want many different types of flowers to create a beautiful garden. In the same way, you need many different types of faiths to make our world a broad, varied and all embracing place. We should celebrate the diversity of religion in the same way we celebrate biodiversity, national diversity, and linguistic diversity. There is no religion that is better than another. We have to say that religion is not truth-truth is in religion. You are looking for truths. All paths lead to God. Whatever way you follow, you can follow the paths and practice to live in harmony in the universe. What do you believe the biggest obstacle will be to achieving this? The most difficult obstacle to interfaith relations is the conditioning of our minds. We have been conditioned to think that one religion is better than another and we have a narrow self-interest to only promote our religion. We have to look beyond our narrow interest and consider our common ground. If you look deeply, you will find that all religions have more in common than they do differences, such as love for the earth, compassion and a sense of service. The best way to bring harmony is to highlight the way we all come together and share our visions. The differences are small but we exaggerate them and highlight them rather than commonality- the best way to overcome our divisions is to highlight our similarities. Do you think music from spiritual traditions has a capacity to connect tradition and modern life? Music is a great power of uniting people. When you are singing together, you don’t have differences as these melt away as you sing. We transcend our divisions and become one, we are members of one human community Music is the best way to unite people and for us to participate in singing. Is there a particular piece of music that you feel promotes interfaith harmony the best? There are many kinds of musical traditions, and I find them all wonderful. I enjoy sitar music, which is played by many Muslims in India, as much as I enjoy more accomplished musicians in the West, such as John Tavener. When they play, you are moved and transported to another world and inspired, regardless of whether you are Hindu, Muslim or Christian. This is why I believe the tradition of sacred music is very important. How do you feel we can best spread this message amongst the younger generation? The best way to engage with the younger generations is to invite them to musical or interfaith events. I feel like young people are hungry for these experiences. In the 60s, Bob Dylan and the Beatles had a deep love for peace and were great with engaging with younger people. We need to find some music that is accessible to young people. John Lennon’s song Imagine moved millions of young people, so we need to find music that inspires and moves young people in this era. Music can inspire. You can marry popular music with music that has deeper spiritual values, which is what they achieved in the 60s- they had great ideas, which were spiritual and uplifting. What do you think is the best way of improving our environmental and ecological awareness? The best way is to understand that the freedoms we enjoy are limited. We cannot have unlimited things which create global warming, climate change, pollution of the oceans etc. All these kinds of activities will lead to a disaster for humanity and the earth, and therefore we have to restrain our consumption and live an elegantly simple life. Elegant simplicity should be embraced- when you have a life of elegant simplicity, you can have a life beautiful things, good food, well made clothes which last a long time, houses which are built by hand which are ascetically beautiful and you are happy. Have a few things, but have good things that last a long time so that you don’t waste anything. If we can eliminate pollution and waste and celebrate the gift of the earth that we are receiving every day, we can stop the destruction that is happening. In some of your work, you speak of the ways in which modern education fails to equip students for life. What do you think it is about practicing real skills over acquiring theoretical knowledge that enhances our lives? Within education, I work on two projects. The first is the Small School in Hartland, Devon, which is a school for young children aged 11-16. These children learn how to grow and cook food, build houses and make things with their hands. We believe that children should have the education of the head, heart and the hands, which does also involve academic education. However, we also recognise the need to have feelings and emotions, and we need to develop how we feel and how to cultivate our feelings of compassion and joy. All these values are just as important as learning mathematics or physics. Development of the heart and the head should go hand in hand together. Through hands, we can manifest our imagination into reality. We should not be teaching our children to just be consumers, we should be teaching them to be makers and creators. Don’t think about consuming, think about making and consumption will follow- when you have cooked something, you will then eat it. I want to emphasis the practical education of young people, where they learn skills of life. The second project is Schumacher Collage, where the students participate in practical things, such as gardening, and cooking. This way head, heart and hands are included in the education of the older students. We believe subjects shouldn’t be divided into departments as it encourages isolation. All the subjects are interconnected; we have to consider how they all fit together, as we need to find a balance and a harmony. Education is very close to my heart, and through these projects I hope we can create a holistic education that is not compartmentalised. The third project is editing Resurgence & Ecologist magazine which is an educational publication presenting a holistic world view. Through Resurgence & Ecologist we promote culture, conservation and community values. We have regular articles on social justice, ethical living, spirituality and environmental sustainability. The magazine was established in 1966 so next year we will be celebrating our 50th anniversary at Worcester College, Oxford from 22nd – 25th September. Through these three projects I have been able to make a small contribution in the ongoing awareness about the values of good life and good society. It has been my privilege and joy to be of service in a small and humble way to humanity and to the earth.